On Thursday, October 22, 2015 at 11 a.m. leaders from the University of North Carolina at Chapel Hill, including Chancellor Carol L. Folt and Board of Trustees chair Dwight Stone, will join the presidents of development partner firms Cousins Properties and Northwood Ravin and Mayor Mark Kleinschmidt for the formal groundbreaking at Carolina Square (123 West Franklin Street). Details Here. Demolition of University Square, May 2015. This past May, demolition began on University Square to make way for the newest chapter in downtown Chapel Hill’s changing skyline, Carolina Square. The mixed-use development, with 246 apartments and over 200,000 square feet of office and retail space, promises to be a major attraction when finally finished sometime during the summer of 2017. No doubt many of us will have memories of University Square for years to come. I spent a fair amount of time myself relaxing in Swenson’s after a full day of classes on campus; and who can forget those late night “Time Out” chicken runs with friends after an exciting night on the town. (Lucky for us all, Time Out is still thriving in a new location at 201 East Franklin Street.) However, the demolition of the square is only the latest chapter in the property’s rich history which can be traced back into the 1830s. In 1832, when Chapel Hill was barely a dot on the map, the university had only been accepting students for 37 years and total enrollment consisted of a about 100. At the time, little more existed beyond the main downtown district on East Franklin Street with the exception of Nunn’s Tavern, named for the proprietor, Betsy Nunn , which stood at the South corner of the then unnamed Columbia Street and Franklin Street. This spot would, as if linked by some divine destiny, become the eventual home of the University Baptist Church, which opened its doors in 1933. The residences of Dr. Jonathon Blakeley Jones and Mary Southerland, occupied the remainder of the property to the west. The town was beginning to blossom after the Civil War. By 1873, this tract of land had become appealing to several notable figures of the time including Miss Hattie Cole who relocated from Wilmington to purchase the eastern home tract located almost directly across from present day Church Street. Hattie Cole, came from a proud line of UNC notables and her nephew, James Taylor, was a retired banker and directly linked to descendents Dr. Isaac Taylor, former dean to UNC School of Medicine, and popular current day musician and James Taylor. She, her nephew, and her sister Catherine lived in the house nearly forty years until it was eventually sold in 1915 to the Town of Chapel Hill to build the new public school. The once majestic home was relocated toward the south east portion of the property and converted into small apartments known as the Hill House. University Baptist Church purchased the home after World War II where it eventually played host to the town’s first public library in 1958 despite the home’s poor condition. After ten years, the library was relocated and the dilapidated home was then demolished. Dr. Jone’s home, which sat just west of the Hattie Cole house, changed hands several times during this period. Notable residents included UNC English Professor and co-founder of the first YMCA in America, Thomas Hume, who purchased the home in 1887. Wealthy UNC alumnus and philanthropist Caesar Cone, eventually purchased the home in the late 1920’s and leased it to Zeta Beta Tau, UNC’s first Jewish fraternity. Chapel Hill School, circa 1930's. After the town purchased Hattie Cole’s house in 1915, it began work on the multi-story brick school building, which was quite modern for the time, to replace the long-deficient Pittsboro Street facility. The newly erected school was completed in the spring of 1916 and housed all elementary and high-school aged students. Known simply as the “Chapel Hill School” or the “Chapel Hill Graded School,” students from outside the town limits were also allowed to attend for a fee (however the school board usually subsidized this fee most years). Students and administrators alike were quite proud of the new facility. N. W Walker, Secretary of the School Board , wrote a detailed historical accounting in Chapel Hill High’s very first edition of Hilllife in 1925; noting that the school was “a very sharp contrast” to the old school. By 1925 Chapel Hill school housed 555 pupils, 245 of which were high school grades, and on the whole, was better funded. Despite the new accommodations, the student population soon outgrew its red brick building and a brand new Chapel Hill High School was erected on Columbia Street where the present day “School of Pharmacy” stands. However, in the summer of 1942 the building was razed by fire after only five short years of service. With a war on, resources were scarce and students were relegated to using makeshift facilities including the Baptist Church, basement of the Elementary School, and the Cone House (owned by UNC by this time and used to house school administrative staff) until the completion of the first wing of the New High School, which now sat on the same lot between the Elementary School and the Cone House, in 1947. Described as a “handsome colonial style building, Chapel Hill High saw several improvements over the next decade. Construction on the main building continued until its completion in 1952. In 1958, the beloved recreation center under direction of Sarah Umstead, was razed and a new gymnasium was constructed for the school later that year. A new cafeteria followed in 1959. By the 1950’s new elementary schools alleviated the overcrowding burden leaving only the junior high aged students in the old Elementary School. The 1960’s for the property could best be described as a time of change. 1963 saw the integration of the first African American students to now renamed Chapel Hill Junior High School, Carrie Farrington explained during a recent interview that they “all sort of stuck together because there wasn’t that many of us…[that] you had to really show them that you fit in.” Integration of the high school did not take place until three years later, in 1966. By 1965, the last class to attend Chapel Hill High was winding down and a new high school off of Homestead Road was nearing completion. The new integrated high school was larger, more modern, and better suited to meet the needs of the expanding student population. Frank Kenan , founder of several oil and transportation companies and a major UNC benefactor, purchased the entire property from the town for 1 million dollars. University Square replaced the former school properties and the Cone House, opening in 1967. Other adjacent properties also met their end during this period. The McDade House, another historic home from the 1800s, was dismantled to expand the growing Baptist Church, despite efforts from local preservationists to save it. UNC announced in May 2015 that The Core@Carolina Square will be located in the new development. 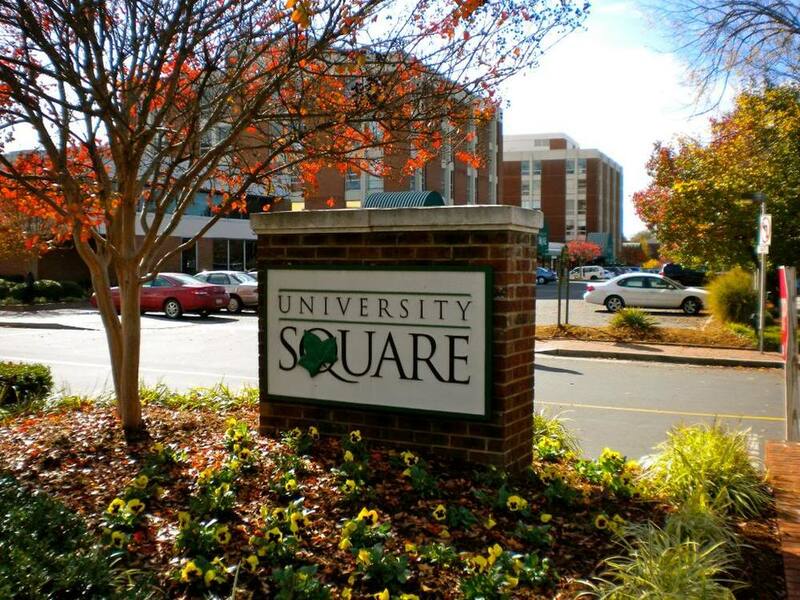 University Square, with it ample parking, modern facilities, and its high-rise dormitory style apartments, was a catalyst for change for West Franklin Street; even enticing established East Franklin businesses to relocate. Thomas Kemp and his wife Mary Lucile relocated their jewelry store to University Square in 1968. With its soft carpeting and extravagant fixtures, it was characterized as “worthy of Fifth Avenue.” The Little Professor Book Store and “Ken’s Quickie Mart” were a popular waypoints for students for over ten years; however in 2009, University Square was purchased by Chapel Hill Foundation Real Estate Holdings, UNC’s nonprofit real estate arm and rumors of possible redevelopment plans began to surface soon afterward. With the demolition crane fast approaching, some long standing businesses elected to close altogether, however many businesses chose to relocate. The Eye Care Center now resides across the street from its old location. Folks are still bending at the Franklin Street Yoga Center in the Courtyard, and Time Out is still serving that chicken we know and love just down the street. The next historical chapter, Carolina Square, is already being written. With its one acre of green space, 880 car parking deck and 200,000 square feet of office and retail space along with leasing commitments from both UNC and Carolina Performing Arts will also prove to be the next perfect catalyst for growth and change for a whole new generation of Chapel Hill residents. However, if on opening day, if you do recognize someone from the older generation strolling through and admiring the newly landscaped scenery, you may want to take time out to inquire, reminisce and remember the site’s rich historic past.